Understanding and improving human work is relevant to most people in the world, and a number of professions are dedicated to improving human work (e.g. human factors/ergonomics, quality management, industrial/work/organizational psychology; management science). The trouble with many of these professions is that the language and methods mystify rather than demystify. Work becomes something incomprehensible and hard to think about and improve by those who actually design and do the work. Recently, some notions that help to demystify work have gained popular acceptance. One of these is the simple observation that how people think that work is done and how work is actually done are two different things. This observation is very old, decades old in human factors and ergonomics, where it dates back to the 1950s in French ergonomics (le travail prescrit et le travail réalisé; Ombredanne & Faverge, 1955) and arguably the 1940s in analysis of aircraft accidents in terms of cockpit design (imagination vs operation). Early ergonomists realised that the analysis of work could not be limited to work as prescribed in procedures etc (le travail prescrit), nor to the observation of work actually done (le travail réalisé). Both have to be considered. But these are not the only varieties of work. Four basic varieties can be considered: work-as-imagined; work-as-prescribed; work-as-disclosed; and work-as-done. 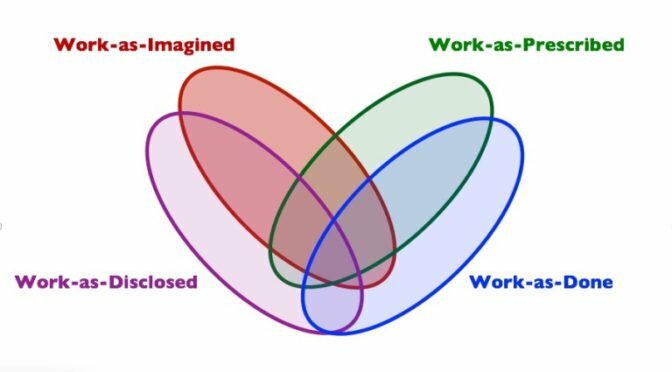 These are illustrated in the figure below, which shows that the varieties of human work do usually overlap, but not completely, leaving areas of commonality, and areas of difference. Here we will consider each variety, one by one. The varieties of human work. When we think about human work, we typically think about the things that we actually do. But in thinking about what we or others do, we have already uncovered another important type of work – the work that we imagine. Work-as-imagined is both the work that we imagine others do and the work that we imagine we or others might do, currently or in the future. The imagination of human work takes place within organisations, between organisations, and from outside of organisations. If we take the example of operational staff (e.g., clinicians, pilots, train drivers, control room operators, road maintenance workers), then the policy makers in national and local government, along with regulators and inspectors, and the general public and various groups (e.g. patient groups, transport user groups, neighbourhood associations) will have an imagination about the work of the operational staff (as well as also the work of middle and senior managers within facilities or companies). Within a facility or company, senior management and middle management, along with non-operational specialists and support staff, will also have an imagination of the work of operational staff. Operational staff will have an imagination of the work of all of the above, and of other operational and non-operational staff in different specialities, inside or outside of the organisation. To a greater or lesser extent, all of these imaginations – or mental models – will be wrong; our imagination of others’ work is a gross simplification, is incomplete, and is also fundamentally incorrect in various ways, depending partly on the differences in work and context between the imaginer and the imagined. Work-as-imagined is fed by three basic sources: past experience of work-as-done; knowledge and understanding of work-as-prescribed; and exposure to work-as-disclosed. All three of these are problematic. Past experience of work-as-done can be a useful foundation for work-as-imagined, but it can quickly become outdated with changes in demand, resources, constraints, and changes to how the work works. This outdatedness can be a blindspot. Work-as-prescribed is difficult to understand even for those doing the work, let alone those who do not, is under- or over-specified, and is often far from reality. Work-as-disclosed, meanwhile, is partial and often biased. Work-as-imagined also applies to our imagination of future work, to change – adaptation or transformation. Most human work begins with work-as-imagined, since someone has an imagination about how work could be done, unless new ways of working are discovered accidentally. In practical terms, this future work-as-imagined includes changes to tasks, workflows, jobs, team and organisational structures and processes, and technology. These changes are the subject matter of human factors and ergonomics (i.e., interaction design), but of course changes mostly happen with no HF/E input. Especially in cases where decisions about the work of others (or that affect the work of others) are made by those whose imagined view of work is incorrect, work-as-imagined can become very problematic. In such cases, inadequate involvement of those who do the work (work-as-done), and inadequate analysis and synthesis of the evolving context of work, often leads to badly designed work and work environments, and unintended consequences, including adaptations to work-as-done to overcome constraints and to work around other unintended consequences. Much analysis work is done on human work, but this is often done on this imaginary variety. In the context of oil and gas engineering, Miles & Randle (2016) stated that “The design and engineering of new assets is usually contracted out … These contractors may not receive direct feedback on the success of, or problems with, their previous designs in the field, and most engineers designing the asset will not have worked on or even visited an operating installation.” The analysis of imagined work can be seen in the use of many ornate methods, used by those who are distant from the work or have inadequate access to those who do the work – the field experts. Hence, what we are deconstructing and analysing, formally or informally, is often an imagined, abstract system, not a real, concrete one. Our imagination of human work is not necessarily the same as the way that work is prescribed. Work-as-prescribed is the formalisation or specification of work-as-imagined, or work-as-done, or work-as-disclosed, or some combination of the three. It takes on a number of forms in organisations, including: laws, regulations, rules, procedures, checklists, standards, job descriptions, management systems, and so on. Some of these are more task-oriented (e.g., procedures, checklists) while others are more job-oriented (e.g., job descriptions). While there are infinite varieties of work-as-imagined, there is a limited variety of work-as-prescribed, with each task having one or a small number of prescribed methods. Work is often prescribed by more senior members of an organisation (supervisors and middle managers), and sometimes by those at a greater distance from the work itself, for instance specialists with little contact with the front line, or external organisations, such as regulators (e.g., work time limits) and policy-makers (e.g., four-hour target for accident and emergency admissions). It is not unusual to see work prescribed far away from the actual work by those who have never actually performed the task. Catchpole and Jeffcott (2016) wrote that, in healthcare, “You will quickly find that there is a difference between policy and practice…and that administrators may not be aware of the latter.” Work is often also prescribed by those who do the work (e.g., working groups), and those have previously done the work, but no longer do so. Work-as-prescribed is unique among the four key varieties in that it is assumed to be the safe and the right way to work. As such, it is subject to risk assessment, and risk controls are incorporated, as well as other measures to control and standardise work-as-done. These controls may involve soft constraints, which are possible to overcome, albeit at a cost (e.g., rules), or hard constraints, which are difficult or impossible to overcome (e.g., forcing functions). Work-as-prescribed is also often the ultimate arbiter of whether performance is satisfactory. The problem is, it is usually impossible to prescribe all aspects of human work, even work that is well-understood, except for extremely simple tasks (Hollnagel, et al, 2013). First, there are many ways in which work can be done. Even if it is prescribed in one way, it could and will probably be done in other ways, even if we just consider small differences in implementation. Second, work often or usually incorporates task switching, between different aspects of different procedures. This meta-level of work is hard to impossible to capture in prescribed work. Third, the pre-conditions for, and conditions of, work cannot all be foreseen, let alone guaranteed. Assumed system conditions – staffing levels, competency, equipment, procedures, time – are often somewhat more optimal than those found in practice. Fourth, it is just not possible to articulate, especially in a linear written form, the precise way that work is done in a way that is usable or that can reasonably be followed. Pariès and Hayward (2016) noted that “in most current industrial processes, strict adherence to preestablished action guidelines is unattainable, incompatible with the real efficiency targets, and insufficient to control abnormal situations.” They say that many requests from their clients derive from “difficulty in reconciling this ‘old truth’ with the inflation of applicable aviation safety standards and the compliance expectations of safety management system frameworks.” Work-as-prescribed is therefore usually under-specified even in its most complicated forms. Procedures, standards, regulations, etc., lack the detail and richness of actual work. And the more specified the prescribed work, the more incorrect is it likely to become in messy work situations (a good example being the checklists in QF32). In other cases, there may be relatively little prescription. As an example from an industry that is almost the opposite to aviation in terms of prescription – web operations and engineering – Allspaw (2016) remarked that there is “no singular overarching regulatory, standards, or policy-making body for these services”. Often, we tend to think that work-as-prescribed is basically the correct way to work. In some cases, this is justified, but in other cases is it not. The famous ‘work to rule’ strategy (used by the National Union of Railway Men against against British Rail) involves a tactical realignment of work-as-done with work-as-prescribed. This has become a standard form of industrial action, also known as a ‘white strike’. The result is that the system cannot function effectively, thus demonstrating the limits of work-as-prescribed. Work to rule has been described as a decision to “Give the rules a meaning which no reasonable man could give them and work to that” (Sir John Donaldson, 959, Secretary of State v. ASLEF (No. 2) ). Similarly, Sir John Denning stated that “Those rules are to be construed reasonably…They must be construed according to the usual course of dealing and to the way that they have been applied, in practice.” The final arbiter for what is reasonable is, according to these statements, work-as-done. Work-as-done, therefore, may be assumed to be reasonable, for all intents and purposes. Of course, when accidents happen, this perspective reverses, such that work-as-prescribed is reasonable and work-as-done is not. Work-as-prescribed is very often a basis for various sorts of analysis, often combined with Work-as-imagined, or knowledge of work-as-done. Like work-as-imagined (but unlike much work-as-done), work-as-prescribed can be deconstructed. It can also be examined and discussed. Examples include risk assessment, task and job analysis, human error analysis, behavioural safety, and so on. Field expert involvement in the development and use of work-as-prescribed is critical to limit the gap between work-as-done. Two problems are common here. The first is a lack of field expert involvement, e.g., job descriptions written by HR, procedures written by a procedure department with little contact with operations. The second problem is that those involved are constrained in their ability to communicate with others who are affected. Those who do the work may well think that no one is involved in prescribed work, and thus lack knowledge to feed back flaws in prescribed work. In addition to the way that we imagine work, and the way that work is prescribed, we can add a third variety of human work: Work-as-disclosed (or -explained, -expounded, -exemplified, or -espoused). This is what we say or write about work, and how we talk or write about it. It may be simply how we explain the nitty-gritty or the detail of work, or espouse or promote a particular view or impression of work (as it is or should be) in official statements, etc. Work-as-disclosed is typically based on a partial version of one or more of the other varieties of human work: Work-as-imagined, work-as-prescribed, and work-as-done. But the message (i.e., what is said/written, how it is said/written, when it is said/written, where it is said/written, and who says/writes it) is tailored to the purpose or objective of the message (why it is said/written), and, more or less deliberately, to what is thought to be palatable, expected and understandable to the audience. It is often based on what we want and are prepared to say in light of what is expected and imagined consequences. How we talk or write about work is not necessarily the same as work-as-prescribed, since prescribed work may not be a good basis for how we disclose or explain how things work. As mentioned earlier, work-as-prescribed may be under-specified or over-specified, or just not how things are really done. So a supervisor might explain to a newcomer ‘how things work around here’ (work-as-done), in a summary form, or in a way that is very different to how work is officially prescribed. But work-as-disclosed is also not necessarily the same as work-as-imagined, because what we think or believe may be different to what we are prepared to say, especially to outsiders. John Wilkinson (2016), a former regulator in the UK Health and Safety Executive, noted that “People choose what they want to say to regulators … The regulator can start to believe that ‘work-as-imagined’ (what the ideal organization does to work safely) should always match ‘work-as-done’ (the ‘real world’ of business). The right position lies somewhere in-between”. Similarly, Cook and Cooper (2016) stated that “many well-intended shortcuts and deficient workplace practices are routinely not detected during audits. The outcomes of this can be an increasing gap between work-as-imagined and work-as- actually-done, and major system failures may be associated with this gap”. Another example is what a staff member says to a senior manager about work, which may be different to what really happens. There are many reasons not to express how work is really done. For instance, staff may fear that resources will be withdrawn, constraints may be put in place, sanctions may be enacted, or safety margins or buffers will be dispensed. Hence, secrecy around work-as-done can be a self-protective measure against the drive to improve efficiency at the expense of other goals (such as safety and well-being). Work is disclosed or explained (and expounded, exemplified, espoused) by many people, both those who do the work, and those who do not. Some work-as-disclosed is therefore based on (or disclosed with) intimate knowledge of work-as-done. A surgeon and an anaesthetist/anaesthesiologist, may, for instance, advise a patient about a surgical procedure. What is said will reflect what is done, but only at a high level. Other work-as-disclosed is based only on an imagination of the work (work-as-imagined), or else what others say about the work (work-as-disclosed by a third parties). A corporate communications specialist in an airline, air traffic control organisation or professional association, may, for example explain to the news media or via social media the work of pilots or air traffic controllers. Both of these direct and indirect forms of work-as-disclosed will involve simplifications. In other instances, work-as-disclosed may not deliberately simplify. An example is a train driver explaining his or her work to a human factors specialist/ergonomist who is undertaking some form of task analysis. Here, the driver will be thinking about his or her work in detail, and explaining it perhaps in more detail than ever before, except perhaps to a new train driver who is undergoing on-the-job training. People will sometimes modify or limit what they say about work-as-done based on consequences. In an environment where people are punished for trade-offs, workarounds, and compromises, which the staff believe to be necessary to meet demand, then the overlap between work-as-disclosed and work-as-done may be deliberately reduced. Some work-as-disclosed is explicitly designed to reassure, perhaps to provide a basis for work-as-imagined in the other that aligns with work-as-prescribed (e.g. “We fully comply with all relevant rules and procedures”). In a healthcare context, Catchpole and Jeffcott (2016) wrote that “Direct observation usually illustrates a further difference between what is said and what is done.” The celebrated US Anthropologist Margaret Mead was credited with saying “What people say, what people do, and what they say they do are entirely different things” (there is no written evidence that she every did say this, but it is reflective of aspects of her work). If there is a culture that is mutually experienced as fair and trusting, then there is a good chance that the overlap between work-as-disclosed and work-as-done will be large. In such cases, the areas of lack of overlap may be limited to inconsequential minutia, or aspects of work that are not easily available to conscious inspection from the inside, bearing in mind that much human work is based on unspoken assumptions and norms, and unconscious patterns of activity. Formal methods for understanding work via work-as-disclosed include individual and group interviews, using a wide variety of more or less structured methods from psychology, human factors and ergonomics, sociology, ethnography, etc. Some of these methods are used in situ along with work-as-done (e.g., think aloud) but most are used remote from work-as-done (e.g., critical incident technique; focus groups). In some cases, assurances of confidentiality may be required to increase the overlap between work-as-disclosed and work-as-done. In all cases, one needs to be mindful that what is said may well differ from what is done. Work-as-done is actual activity – what people do. It is characterised by patterns of activity to achieve a particular purpose in a particular context. It takes place in an environment that is often not as imagined, with multiple, shifting goals, variable and often unpredictable demand, degraded resources (staffing, competency, equipment, procedures and time), and a system of constraints, punishments and incentives, which can all have unintended consequences. Work-as-done is mostly impossible to prescribe precisely and is achieved by adjustments, variations, tradeoffs, compromises that are necessary to meet demand. These adaptations are based on operational know-how, but often have not been subject to formal analyses such as risk assessment; such analysis struggles to handle them. While the adaptations are often necessary to meet demand, they can sometimes put the system and practitioners at risk. This raises ethical problems, according to van Winsen and Dekker, who stated that “We need to ask ourselves, if it is ethically right that operators routinely need to work around or loosely interpret many official procedures…to get their work done?”. One should not get the impression that work-as-done is necessarily the right way. In the context of the rail industry, O’Flanagan and Seeley (2016) noted that “sometimes the motivations for the way that the work is actually done are not laudable.” These motivations may arise from various sources, of course, at different levels within and outside the company. In light of the risks of disclosing all aspects of work-as-done, workers may keep aspects of it secret, or protect their working environment so as not to expose it. Aside from the risk of sanctions, the reason for this is a suspicion that if a decision maker sees a snapshot of work-as-done, then they may generalise from that snapshot, or make assumptions, and change the design of work system, perhaps changing work patterns (e.g., shift systems or work times, or activities), altering team structures, reducing resources, or tightening safety buffers or margins, usually in order to increase efficiency. Work-as-done can be examined via observation, but this is challenging. It is particularly prone to change on inspection. This is a known flaw of, for instance, behavioural safety schemes and safety audits, especially those that focus on negatively perceived behaviour, or are perceived as checks of compliance or non-compliance with work-as-prescribed. It can also be very difficult to understand (e.g., the work of a radar controller or radiologist), or unsafe to observe (e.g., military personnel). Work-as-done is the most important and yet most neglected variety of human work. It is the variety that outsiders (those who do not do the work) pay least attention to. Much attention is paid to the other varieties of work, and this would not be a problem if it were not for the fact that these other varieties are so often mistaken for, or used as a proxy for the real thing: work-as-done. Hollnagel (2016) noted that “We lack models based on what people actually do, on the recurrent patterns of behavior.” This is probably more true of some industries than others. By involving field experts in any activity to understand work, and by getting close to where the work is done, we can help to close the gaps, but there will likely always be differences, and knowing this keeps us humble and aware that our understanding is limited, never complete. Human factors and ergonomics practitioners often find themselves in a privileged but very difficult position, as go-betweens and translators, consciously trying to understand and explain the gaps between the varieties of work to help improve system performance and human wellbeing, without unintentionally bringing about harm along the way. The early ergonomists were right. The analysis of work cannot be limited to work as prescribed in procedures etc (le travail prescrit), nor to the observation of work actually done (le travail réalisé). Similarly, it cannot be limited to work as we imagine it, nor work as people talk about it. Only by considering all four of these varieties of human work can we hope to understand what’s going on. Allspaw, J. (2016). Human Factors and Ergonomics Practice in Web Engineering and Operations: Navigating a Critical yet Opaque Sea of Automation (Chapter 25). In S. Shorrock and C. Williams (Eds. ), Human factors and ergonomics in practice: Improving system performance and human well-being in the real world. Boca Raton, FL: CRC Press. Catchpole, K. and Jeffcott, S. (2016). Human Factors and Ergonomics In Healthcare: Challenges and Opportunities (Chapter 13). In S. Shorrock and C. Williams (Eds. ), Human factors and ergonomics in practice: Improving system performance and human well-being in the real world. Boca Raton, FL: CRC Press. Cook, B. and Cooper, R. (2016). Human Factors Practice in Military Aviation: On Time and On Target (Chapter 16). In S. Shorrock and C. Williams (Eds. ), Human factors and ergonomics in practice: Improving system performance and human well-being in the real world. Boca Raton, FL: CRC Press. Hollnagel, E. (2016). The Nitty-Gritty of Human Factors (Chapter 4). In S. Shorrock and C. Williams (Eds. ), Human factors and ergonomics in practice: Improving system performance and human well-being in the real world. Boca Raton, FL: CRC Press. Miles, R. and Randle, I. (2016). Human Factors and Ergonomics Practice in the Oil and Gas Industry: Contributions to Design and Operations, (Chapter 17). In S. Shorrock and C. Williams (Eds. ), Human factors and ergonomics in practice: Improving system performance and human well-being in the real world. Boca Raton, FL: CRC Press. O’Flanagan,, B. and Seeley, G. (2016). Human Factors/Ergonomics Practice in the Rail Industry: The Right Way, the Wrong Way and the Railway (Chapter 14). In S. Shorrock and C. Williams (Eds. ), Human factors and ergonomics in practice: Improving system performance and human well-being in the real world. Boca Raton, FL: CRC Press. Ombredanne A. & Faverge J.-M. (1955). L’analyse du travail. Paris : PUF. Pariès, J. and Hayward, B. (2016). Human Factors and Ergonomics Practice in Aviation: Assisting Human Performance in Aviation Operations (Chapter 15). In S. Shorrock and C. Williams (Eds. ), Human factors and ergonomics in practice: Improving system performance and human well-being in the real world. Boca Raton, FL: CRC Press. Secretary of State v. ASLEF (No. 2)  2 All E.R. 949 at 959 (N.I.R.C.) per Sir John Donaldson. Cited in William Twining and David Miers (2010). How to Do Things with Rules. Cambridge University Press. p. 41. Wilkinson, J. (2016). Human and Organisational Factors in Regulation: Views from a Former Regulator (Chapter 20). In S. Shorrock and C. Williams (Eds. ), Human factors and ergonomics in practice: Improving system performance and human well-being in the real world. Boca Raton, FL: CRC Press. van Winsen, R. and Dekker, S. (2016). Human Factors and the Ethics of Explaining Failure (Chapter 5). In S. Shorrock and C. Williams (Eds. ), Human factors and ergonomics in practice: Improving system performance and human well-being in the real world. Boca Raton, FL: CRC Press. Hi Steven, great article ! It clarifies a lot of nuances around the practical drift concept . One aspect which you touched on but did not go deeper on is the mild hypocrisy of the industry that very well knows that work as done does not coincide with work as prescribed, all too often, management counts on it. When in aviation a tight deadline (say AOG situation with a 3 hour maintenance task) the job is done quicker ( say in an hour) very often noone asks questions how that job was done. Unless things go wrong of course, then it will be quickly pointed out the job was “rushed” . My observation is that many organisations constantly borrow from this margin between the work as prescribed and work as done, and noone has much incentive to disclose how it was done, there is a silent agreement that “the job got done and lets leave it at that” so work as done stays in theis grey zone until it goes wrong. How do you propose to create the incentive to talk about this organisational borrowing. Also, where does it leave an organisation (and the regulator) ethically and legally it allows a situation that cannot possibly reconcile work as done with work as prescribed? If everyone “knows” the job can’t be done as prescribed and pretends in audits etc thats how they are working, we leave people doing the work in a perpetual limbo. This is where I find the local rationality concept of the Systems Thinking toolkit very useful, revealing these goal conflicts that shape local rationality should be the first step, but what comes after? Can the 2 be realistically reconciled?